Eddie Richards, also known as Evil Eddie, Jolly Roger, and Kode, is a British DJ, sometimes known as "Britain's godfather of house". He was one of the first DJs to champion house music back in the mid 1980s and one of the UK's original mix DJs residing at London's Camden Palace, voted best club in the world in Record Mirror. Richards was born in Amersham, Buckinghamshire, England. He first came to prominence in the 1980s as DJ at the Camden Palace in London. He became resident DJ at Clink Street where he played a major role in introducing house music to the UK, and he has been called Britain's "godfather of house". After playing at underground clubs as Clink Street and Heaven in London and Manchester's Hacienda, Eddie Richards went on to headline the legendary UK pay parties Sunrise, Energy and Helter Skelter among many others. 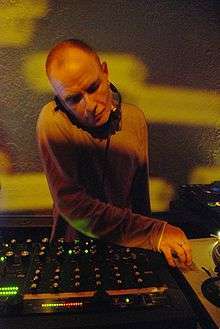 Remix and production work led to the release of club classics such as "Acid Man" in 1988, which reached number 23 in the UK singles charts, followed by other popular remixes of Ralphi Rosario, Orbital and The Shamen. In June 1990 Eddie Richards founded the DJ agency dy-na-mix. Later, Richards devoted more time to music production, releasing and licensing tracks with labels in the UK, Europe & US including End Recordings, Hypervinyl, Matter/Form, SoCo Audio, Northern Lights, LHB, & own labels Lunar Tunes, dy-na-mix & Storm. Besides his long standing residency at Wiggle, a series of London underground parties, Eddie spins regularly at Fabric in London and has been featured in the Fabric Mix CD series.